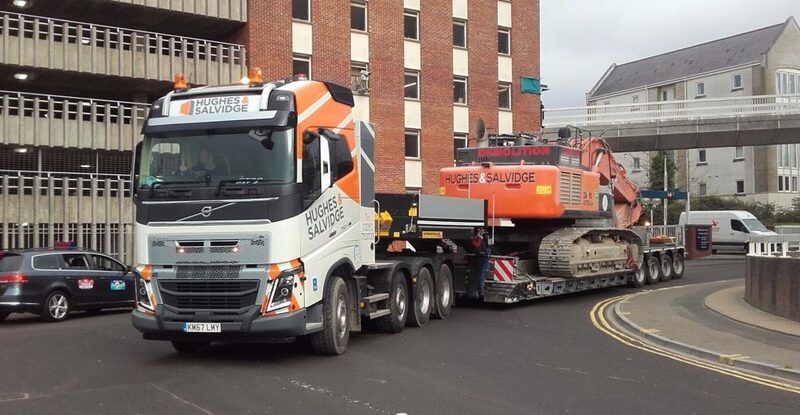 Hughes and Salvidge always ensure that our team have the latest tools and equipment to deliver all of our projects to the highest of standards. We regularly update and increase our plant, equipment and fleet, and this week we welcomed our new low loader to the fold. Our new addition is a Volvo FH16 8×4 tractor unit, capable of pulling up to 150 tonnes and moving all of our plant and equipment, including our 470 and 490 excavators, and our sisters company, K&B Crushers’, crushing plant. Joined by a new Faymonville 4-axel trailer, this 16-litre, 750 brake horsepower low loader is an excellent boost to the Hughes and Salvidge equipment roster.